It was more than a year ago that I wrote about how business owners on the north east section of Portage Avenue felt as if the MLCC – Manitoba’s liquor commission – were ‘licencing mayhem’ by allowing beverage rooms and low-rent hotels (usually housed in the same building) to sell cheap king cans of beer to people starting at 9 in the morning and throughout the day. They were tired, they said, of the rampant drunkenness, vagrancy, fights, threats and hooliganism and public urination. 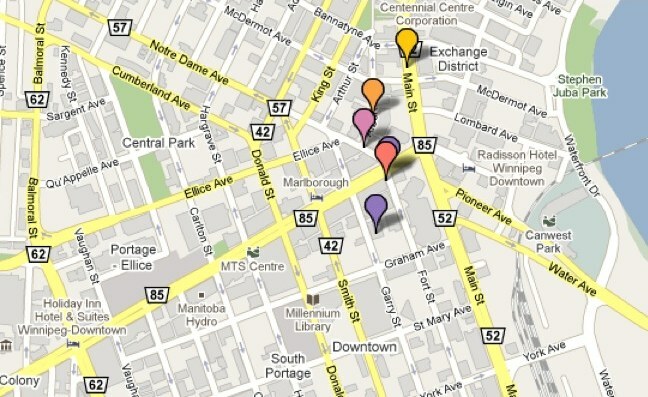 The above map shows just a few of the places in the heart of downtown where booze is available cheap and early. In Today’s FP, we see that there’s a new plan to save downtown courtesy of CentreVenture, the city’s downtown development agency. And it sounds great to a guy who has no head for numbers. But I’d just want to add that prior to doing this, the city should first consider making the area a ‘zero-tolerance’ zone for public intoxication, panhandling and vagrancy. That means, to start, no more cheap booze sold to anyone, at any time, period. We could look at the Minneapolis example of how officials — with help from corporations — completely revamped the Nicollet Mall, once a haven for petty crime and drug dealing — and turned it back into a favoured destination for tourism and other folk in the city. Until these crime-related issues are addressed first, no amount of boutique hotels or TIF zones will make people go downtown and stay downtown – especially after 5:30 or 6 p.m. Currently, you cannot walk from Portage Place [a notorious drug-dealing hub for street gangs] to the Richardson Building without being hassled by someone wanting something, change, a smoke, whatever. Often, the hasslers come in packs. These beverage rooms and hotels are simply feeder zones that fuel the downtown’s demise. And we allow them to stay open. Unless this changes, nothing else will, I suspect. “James: couldn’t agree more with your comments. I can tell you from first-hand experience, nearly ALL crime downtown is fueled by alcohol and other intoxicants. Police can’t do much except for temporary detainments at the Main Street Project (75 Martha). [edited], taking their fuel away may help alleviate the devastating influences these people have on the safety, image and prosperity of our downtown. 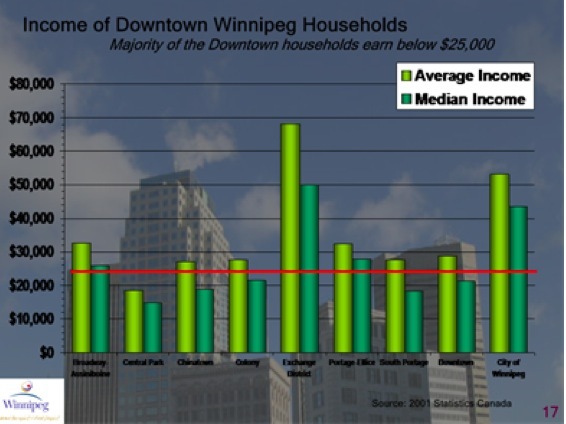 ———Via Facebook poster, Mike W.
“Having lived in several different cities and provinces over the years, the thing that strikes me about Winnipeg’s downtown is that is has a high concentration of social housing right smack in the areas where the city would like to attract people. Saskatoon, for example, has next to no social housing in the core, and you can walk around the MidTown Plaza area and go to a pub after work without seeing one panhandler or intoixicated person or streetfight.